The westernmost group of islands in Polynesia includes the independent state of Samoa. Upolu is the most densely populated of the Samoan islands, with a population of approximately 180,000. As with many islands, Upolu imports mostly everything, including energy. Electricity was first introduced to the island in 1951. Developing indigenous renewable energy and minimizing an over-reliance on fossil fuels was identified as a significant barrier to long-term growth and environmental stewardship. In 1987, the island received funding from the World Bank and its affiliates, to harness the island's untapped hydroelectric potential. The Samoan Government, along with the Electric Power Corporation (EPC) created the 66-foot tall Afulilo gravity dam and reservoir to produce electricity for use at the country's Ta'elefaga Power Station in Fagaloa. Commissioned in 1992, the Ta'elefaga Power Station required the installation of 2.41 miles of piping and penstock in order to connect the 640-acre reservoir with two 5,400 HP Pelton turbine-generators. This project provides approximately 25% of the island's total electricity to date. One of the main issues stemming from the dam's creation has been the release of hydrogen sulfide (H2S) gas due to the anoxic decomposition of organic matter trapped below water. There are many plants and trees that have been submerged since the dam was first flooded. Additionally, quick-growing vegetation emerges along the shoreline of the reservoir as the water level drops, to only be covered with water once the rainy season begins. Hydrogen sulfide produces a foul odor that is very unpleasant, heavier than air, and corrosive in nature. Over time, the H2S corroded the hydroelectric equipment and parts of the concrete dam itself. Water discharged from the power station deteriorated water quality and the marine ecosystem of Fagaloa Bay. Residents of the either villages of the Fagaloa District make their livelihood from this bay, and there was a significant decrease in productivity once this project was completed. For many years, local residents complained about the obnoxious "rotten egg" smell that typically coincides with the rainy season. Several environmental studies were conducted over time, including the year-long investigation by the EPC & Scientific Research Organization of Samoa (SROS). The study concluded that circulation and oxygenation of the reservoir's water provided the most cost effective solution to H2S formation. The addition of atmospheric oxygen via submerged aeration in the reservoir converts H2S to sulfate (SO4), an odorless and non-corrosive gas. King Construction LTD contacted Air Diffusion Systems (ADS) in the winter of 2015 to design a system for consideration by the EPC and other governmental agencies. A total of 44 ADS "LTC" Disk Modules, 82,200 feet of self-sink feeder tubing, and three 40-horsepower Kaeser Compressors were selected after careful examination of the data and reports available. Two compressors normally operational, and one as a standby or the third can be run anytime to improve odor treatment. After a short review process, the ADS solution was approved for installation in the first half of 2016. John Hinde, president and owner of ADS, traveled to Samoa along with Brandon Seper, to oversee installation of the aeration system and train the local staff and engineers on how to operate and maintain the system. King Construction provided labor, equipment and resources to complete the installation in less than 2 months from start to finish. Thankfully, aeration is an ideal treatment process for reducing hydrogen sulfide. With ADS' diffusers, oxygen is added to the water column and a reaction between oxygen and hydrogen sulfide react to produce odorless sulfate. By adding 44 of ADS' diffusers, the erosion at the face of the dam will be mitigated and the odors affecting the area will be eliminated. Dams, such as those like Afulilo in Samoa, are vulnerable to variations in climate, specifically drought periods. 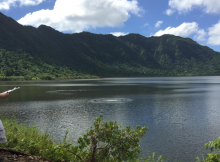 In order for the Government of Samoa to fulfill its renewable energy mandate, it is critical that the water remaining in the dam be free of hydrogen sulfides. One billion bubbles per day for each ADS diffuser requires only two HP per module. ADS fine bubble aeration offers the highest, independently certified, oxygen transfer rate on the market, making it an ideal solution for such a large body of water. The average lifespan of an ADS system is 20 years. However, there are many ADS aeration systems that are fully functioning after 40 years of operation. ADS would like to thank Industrial Water and Waste Digest for selecting this project as a 2016 Top Industrial Project. John Hinde of Air Diffusion Systems can be reached at [email protected] or (847) 782-0044.